[Blind Gossip] Do you recognize this world-famous performer? We have actually featured them before on this site (although they looked very different). No, there is nothing wrong with your vision. There is definitely a lot of weird hair stuff going on! Do you know who it is? Give us your best guess (and try to guess these photo blind items without cheating)! [Optional] What do you think of this look? I’m quite certain it isn’t him (he wouldn’t be called a “performer”), but boy do I see some Mads Mikkelsen there except for the lips. Looks like Heidi Klum to me, in the eyes. My first thought was Anne Heche, but it looks like the person has chest hair. I think it is Paul Bettany. I think. The eyes do look like her! Conchita (aka Conchita Wurst)! Sang a stunning version of The Sound of Music at a charity gala in Vienna last night. I think she looks great! That’s the best Taylor Swift has looked in years! Is that Jared Leto looking—different? Optional: It’s different, for sure. Cate Blanchett for the win! 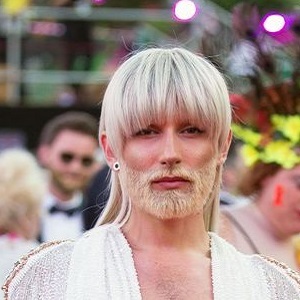 Conchita Wurst with bleached blond hair? Looks like a woman, has mans hair on his chest, cheater….. only men that I can think of that cheated is lance Armstrong and tom Brady. But then they aren’t really performers? I don’t know but I hope it’s for a movie. I know that I’m likely extremely WRONG!, but it looks like Daryl Hannah to me, but it’s probably a man, or some other woman! Optional: It looks VERY BIZARRE!!! Performer: No idea, I though it was Helen Mirren sporting a beard. Or Kenny Rogers is back at it again with the plastic surgery. [Optional] like i said a chick sporting a beard. A guess, Sandra Bullock or Taylor Swift. I know it’s Conchita Wurst, but was reminded of a young Bridget Fonda for a second. Yes! For more than a second.